This is the 2018 version of the Marmot Women’s Teton Sleeping Bag built in a relaxed mummy style with a down fill and with several features introduced to protect you even at very low temperatures. Marmot Teton Sleeping Bag for women. So what you have here is a mummy-style sleeping bag but a bit relaxed type which offers more space than those ultra-lightweight bags. By this, I mean the increased width above the knee zone so that you can bend your legs if you sleep on the side, and this is a women-specific design. This implies an increased insulation in some key areas that are essential for women, and the size and the cut are also women-specific. This all has to do with comfort and thermal efficiency. They build it in two sizes so this gives some flexibility to choose the proper size for you and to avoid carrying an unnecessary weight. The girth is also a good size, see the numbers in the specifications below. The hood is unusually large so that you can put a sizeable pillow in it. Note that you have an additional short zipper on the side to cool if you feel warm in the bag. Seasons-wise, the temperature rating of this bag is such that you might use it even as a winter camping bag. The official rating is 15 F (-9 C). It is certainly good even for rather cool conditions in a 3-season use, and you have an extra zipper on the side in the case you need some draft in a warmer environment. Note also that the main zipper can be unzipped from the bottom as well and you can get your feet out if you feel too warm. Weight-wise, I would describe it as lightweight, the R size weighs 2 lb 15.5 oz (1.32 kg). But there are lighter options on the market and you will see one great example in the comparison table below. Size-wise, as a women-specific design, it is built in two sizes R and L and the corresponding maximum height fit is 5 ft 6 in (168 cm) and 5 ft 10 in (178 cm), respectively. Note that the L size weighs 3 lb 3 oz (1.45 kg) so compare with the R size weight given above. The packed size is 18 x 8.5 inches (46 x 22 cm) and this is not so impressive. Note that the stuff sack is without compression straps so you cannot cinch it down properly, pity. All in all, I see this bag more suitable for a cooler environment than for a warm weather outdoor sleeping. The shell is a 20D 100% Nylon Mini Ripstop and 30D 100% Nylon DWR 1.18 oz/yd. The liner is 20D 100% Nylon Plain Weave. The fill is 650 down and it is treated so you have a coating that makes it water-repellent. They call this system Down Defender. Such a treated down maintains its loft in wet conditions and it dries out faster than untreated down if it becomes wet. It also retains its insulation properties, at least this is what the manufacturer claims. There are some interesting details here. You have ground-level side seams and this is supposed to reduce heat loss through seams because a warm air inside the insulation tends to raise in the upper layers where you have fewer seams. There is also a draft tube behind the zipper to prevent heat loss. A down-filled collar is under your chin with the same purpose. The footbox is also anatomically-shaped for a better fit and comfort, it is trapezoidal by shape with the wider upper part. Some fine details – the chest collar, the pocket, the large hood. Note that they use two-way YKK zipper so you have the best here. One small zippered internal pocket is available and you can see it in the picture above. The bag is EN tested, more details in the specifications below. You have 2 hang loops. Stuff and storage sacks are included. As of the moment of writing this text, the Amazon price for this bag is around $270. So this is an expensive but quality bag and you will see that it is far less expensive than some of its competitors, check the comparison table below. See how I rate this bag. Type: relaxed mummy style bag. – R: 2 lb 15.5 oz (1.32 kg). – L: 3 lb 3 oz (1.45 kg). EN Comfort: 17.4 F (-8.1 C). EN Lower Limit: 4.5 F (-15.3 C). EN Extreme: -32.3 F (-35.7 C). Packed size (L x D): 18 x 8.5 in (46 x 22 cm). – R: 5′ 6 ” (168 cm). – L: 5′ 10″ (178 cm). It might be interesting to see how this down fill bag compares with a good synthetic fill bag, and this is why I add the Kelty’s bag in the comparison table below. I also give one ultra-lightweight bag to realize how light and packable such bags can really be. This all might help you in making an informed choice. Note that all three bags are for women. For the updated prices, please follow the links in the table. So in the summary of this Marmot Women’s Teton Sleeping Bag review, I would say that this new version is better than ever, I love the features and the color. It is designed to protect you even at very low temperatures so you can be sure it will work well for a 3-season use and perhaps even more than that. 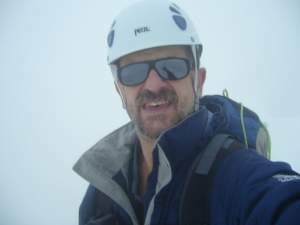 If you are a mountaineer and do high altitude hiking in the summer time then you know that above 3000 meters you are in nearly winter conditions all the time, so this bag is a right tool for such an environment. I am staying in the Alps right now and have been experiencing such weather conditions. You have seen a few alternatives in the comparison table above. If you need more options please visit my page with sleeping bags and see also my list with best 3-season sleeping bags. 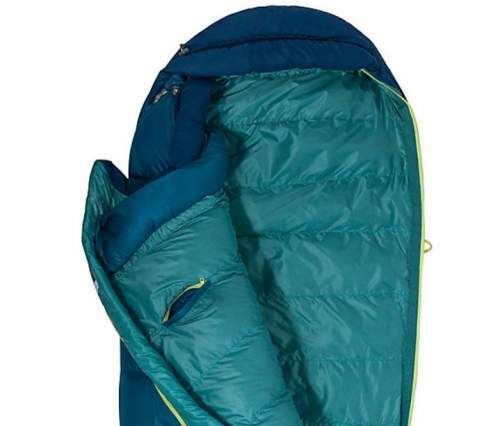 You might want to compare this bag with the Nemo Women’s Cleo 15-Degree Down Mummy Sleeping Bag. Check also the bags from Nemo’s Rave series which are hybrid between rectangular and mummy bags and offer much more space. See also this Marmot Women’s Ouray 0 Degree which is for winter backpacking.